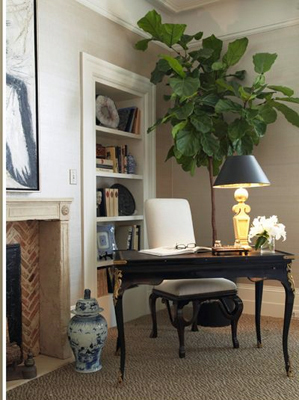 Today I thought I’d highlight what I love most about these rooms decorated by the incredibly talented Cecilie Starin. 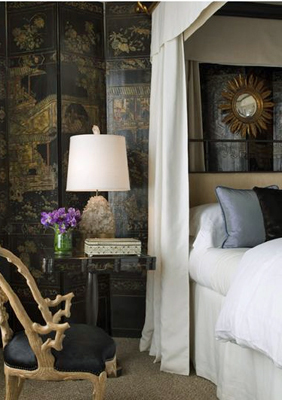 This master bedroom was designed for last year’s San Francisco Decorator Showcase and was one of my absolute favorites. First of all, can we talk about how brilliant the canopy is on the bed above? Everything in this room is so lush and decadent. 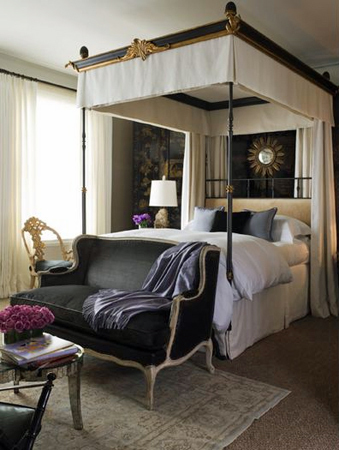 And I love that Cecilie placed a gilt sunburst mirror over the bed. 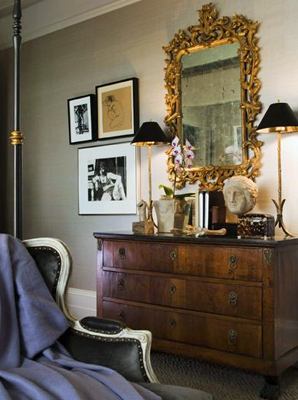 Here is a close-up of the sunburst mirror and my favorite item in the entire room–the oriental folding screen. 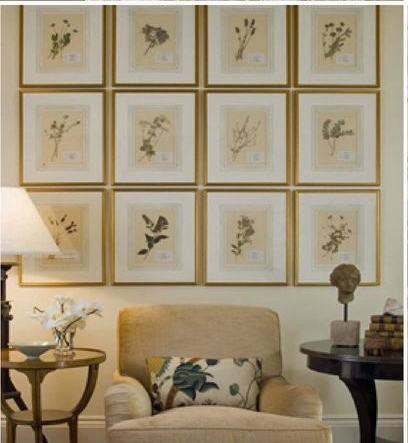 Every detail was carefully considered from the bone-inlay box on the night stand to the statement chair. 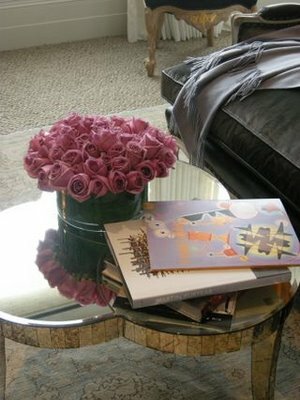 A trained fine art painter, Cecilie says that “every room is a still life” and a great example is this detail shot of gorgeous mauve roses atop a unique clover-leaf table. 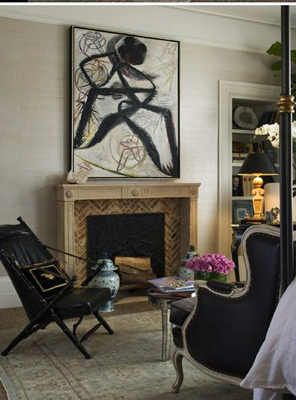 Cecilie’s design style is refined and timeless, and I love her mix of modern art with the antique Italian-style chair, and the bone-inlay fireplace is gorgeous in this room. There is even a small desk and library in the room, and now all you need is room service and you would never have to leave! 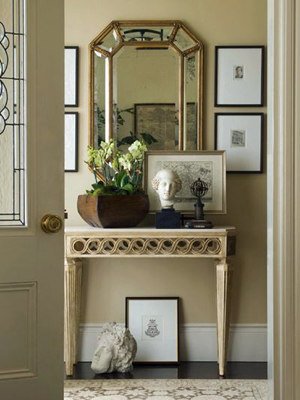 A beautiful antique chest of drawers with dual lamps, elaborate gilt mirror and black and white photos framed next to an art sketch complete the look. I’m always looking for entry hall inspiration and this one by Cecilie is pitch perfect. In this detail shot of a living room Cecilie designed, the chair looks very comfortable and has the very popular snap to grid overhead. 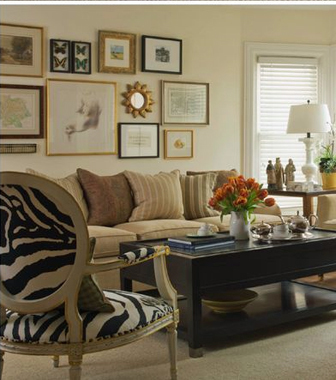 In another living room, photos and art are grouped together for maximum impact and every room needs a bit of zebra stripe, don’t you think?